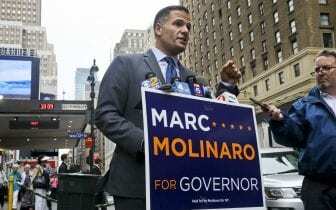 ALBANY, NY (WSKG) – The general election for governor in New York is heating up, with the Republican candidate, Marc Molinaro, calling for the resignation of a former advisor to incumbent Andrew Cuomo, while the sitting governor rallied against President Trump. The GOP candidate for governor is highlighting two controversies that arose in the recently concluded democratic primary. Cuomo was criticized for prematurely opening a new bridge that bears the name of his later father, Mario Cuomo, when there were still some safety questions. In addition, the democratic state party, controlled by Cuomo, sent a mailer to Jewish voters that falsely accused challenger Cynthia Nixon of anti-Semitism. The Cuomo campaign said former top advisor to the governor Larry Schwartz okayed the mailer, but Schwartz neglected to turn the pamphlet over to read the negative side. Molinaro is skeptical of that explanation. Molinaro is calling for Schwartz to resign from the MTA Board. He accuses Schwartz of working as an unregistered lobbyist, just like former Cuomo associate Todd Howe, who testified in the bribery trial of Cuomo’s former closest aide Joe Percoco. Howe is now in prison, and Percoco faces sentencing next month. Schwartz is Chief Strategy Officer at OTG, a company working on the La Guardia airport renovations. It is aloes involved in building gambling casinos, which need approval from the state. Molinaro says he’s submitted Freedom of Information Law requests to prove his allegations. A spokeswoman for the Cuomo campaign, Abbey Collins, says Schwartz is not a lobbyist, and that Molinaro’s charges are baseless. And Collins took shots at Molinaro’s campaign manager, David Catalfamo and a former Republican US Senator. Molinaro released his 2017 tax returns in the spring. The Cuomo camp has said the GOP candidate should release his tax returns from the previous ten years. When Andrew Cuomo first ran for governor in 2010, he did not release his tax returns until after the election. Cuomo, meanwhile held a rally in New York City with democratic elected officials. The governor touted his big win in the September 13th primary, where he won two thirds of the vote over challenger from the left Cynthia Nixon. Cuomo said the party must now “come together like a family”. “We are now going to unify as a democratic party,” Cuomo told the audience of invited office holders and union members. “Do we have differences as a democratic party? Of course we do, otherwise we would be them”. The governor did not mention any plans he might have for a third term, but set his sights, once again, on President Trump. Nor did he mention Molinaro or any of his other opponents, including independent and former democratic mayor of Syracuse, Stephanie Miner. Cuomo says Trump has “declared war” on New York, and he will “lead the resistance” for the nation. 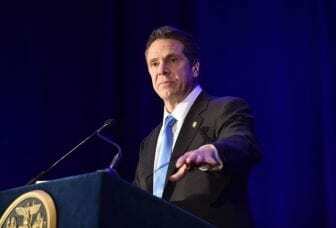 “He has declared war on you,” said Cuomo, who said taxes will go up for New Yorkers, women will lose the right to choose abortion, and members of the LGBTQ community will see their rights “compromised”. Molinaro says he “gets” the anxiety over national politics, but he says Cuomo is trying to draw attention away from his administration’s record. “Andrew Cuomo is like some sort of deranged Wizard of Oz,” Molinaro said. “’Pay no attention to the corruption in my administration. Look over there, it’s Donald Trump’”. Cuomo, when he mentions Molinaro at all, calls him a “trump mini-me”. Molinaro did not vote for the President and does not back many of his policies.